Congratulations to recent alum, Samantha Yosim (nee Flitter), Class of 2016, who became the first Elmer Adler Undergraduate Book Collecting Prize winner to receive an award in the National Collegiate Book Collection Contest. 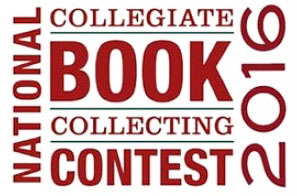 Sponsored by The Antiquarian Booksellers’ Association of America (ABAA), the Fellowship of American Bibliophilic Societies (FABS), the Grolier Club, and the Center for the Book and the Rare Books and Special Collections Division, the contest, which recognizes outstanding book collecting efforts by college and university students, includes the essays of the top prize-winners of officially sanctioned American collegiate book collecting contests across the country. The Adler Prize is awarded annually to an undergraduate student, or students, who, in the opinion of a committee of judges, have shown the most thought and ingenuity in assembling a thematically coherent collection of books, manuscripts, or other material normally collected by libraries as outlined in a personal essay. This entry was posted in Adler Book Collecting Competition on September 7, 2016 by Julie Mellby.